and I feel like I’ve achieved nothing but an increased sensitivity to the rejections. The critiques that make me feel like crying. The way that other people are always picked ahead of me. I’m always the one in the background, and I just cannot do it any longer, not without really beginning to struggle with who I am. Not even sure I have it in me right now to do the Camp NaNoWriMo’s…or even NaNoWriMo in November. I just don’t see the point in breaking my own heart with characters I love but no one else cares about. Maybe I am better off just helping someone else, and the thoughts of my own skills are where I’ve highly overestimated what I write. I fail not because of what I’ve been doing, but what I haven’t been doing. I’ve not been updating my author Facebook or my blog. There are many personal reasons for this – but also many other reasons. I’ve found that blogging was becoming a chore. I’m going to be changing that in the coming months. I promise, this isn’t the last you’ll see of me. So…I know you came here today, expecting something wonderfully written, to do with the terrifying Post-apocalyptic Sci-fi story. I’m sorry >.< I come to you today with one a beginning of one. This story just went nowhere for me. I lost all enthusiasm for it about the same time as I contracted a nasty 2 1/2 week long flu that literally had me down in the dumps. Sci-fi really doesn't seem to be my thing – however…however, the genre for next month? That's something I'm enjoying already. Steampunk Fantasy! But, I digress. Without further ado – I present you with all I wrote….untitled. I hunched, shivering, against the wall that had once bound a mighty river in its set route. Now, of course, water was a premium, as the Thames had been drank, emptied. All of the waters had that led into England. The seas remained, but I had never seen one. I didn’t want to. I wasn’t alone in my cringing state. I couldn’t be. There were a dozen of us, all in the same state. Thirsty, starved and dirty. We wore the scraps of clothing on our back as we roamed the streets of London, abandoned by all but the most desperate. The speeding winds beat at me, whipping my hair and clothes about my body. A scream came from somewhere beside me. ‘Davida’. I knew that scream, knew that voice. She was my sister, my only family member remaining. And yet, I didn’t lift a hand to save her. She’d been marked days beforehand. A fungus, a mould particular to them, had sprouted across her back. We all knew what it meant. We knew what would happen if we tried to stop this. We were born of the first generation after they came to Earth. We’d all believed they were here to bring something new to our lives – to make them easier, somehow. Instead, everyone lived prosperously for a month. A single month in which crops bloomed and the governments were able to put by enough to get everyone through the winter. And then my mother said the Thames itself had dropped by a full foot when the tide came in one day. Davida’s screams stopped suddenly, and instead a slurping sound came from above us. My fist filled my mouth as I bit down on it. I felt hot tears slid from my eyes – draining away water I couldn’t risk losing. I couldn’t curse, and who knew what would happen if I lifted my head. They could choose me next. I flinched as her body fell to the ground, a meaty smack as she landed on the pavement. She wasn’t my sister any more. She was a sack of meat and broken bones – but I could see the gaping hole where her stomach had been. Every organ was missing, her bones protruding up through the ruined mess of her skin like the skeletal remains of fingers, seeking help that would never come. I stayed still, but red filled my vision. It was the rough grip around my ankle that stopped me from moving away. I focus my attention on the cracked paving at my feet. Weeds had tried to grow through before the relentless sun and lack of water had dried them. I hoped they fed well on my sister’s blood. I darted my glance along the tanned, scarred arm to Charlie’s face. He was watching me, but looking up. We held still, our gazes locked. He didn’t look at me in sympathy. It was hate and a promise at revenge. I grit my teeth on a fold of skin in my cheek and tasted the metallic wash of blood. ‘Damn…’ Now I had to keep my mouth shut – and wouldn’t you know it? That’s a hard thing to do when you needed to keep yourself under control. I wished for a moment to scream – but there was a lurching, gluttonous beast. A small disk kept it up in the air. Limbs, too many to count, hung down from it, lax from feeding. I had to keep still, Charlie wouldn’t let me go. He wouldn’t let me get my revenge – and to be honest, I didn’t think it’d be a good idea anyway. Who knew what tools or weapons the beast from beyond this world had? I wasn’t sure myself, and didn’t want to think about it. As March 14th looms, I’m delighted to bring you a little news on the highly anticipated third book in the Summer King Chronicles. Well, not so much news, as a review of the book ahead of the launch. If you haven’t started this series, then what are you waiting for? You need to get in on this trail and follow the adventure. As a kickstarter backer for this series, I was thrilled to be offered an arc copy of this book in exchange of an honest review. Where does one begin but at the end? And what a cliff-hanger of an ending it was! Hold up, what am I saying? The end, of course it isn’t the end. But it is the beginning to an end, and if the last book holds up as much as the previous three have then we’re in for a treat! Battle lines have been drawn, penmanship has been thrown down, and the pitiful cries of surrender have sounded at dawn. Well, that’s not quite true, but it’s close. One day, I’ll be caught up – health and weather permitting. I’ve had a pretty rough time of it lately and it’s knocked everything back. I’ve missed two challenge posts, but I’ll get them up and out to you as soon as I can. The monthly writing challenge, is still a go, and you’ll see the results of the Dystopia theme on Saturday! Shard is a gryfon entrusted with a great responsibility. 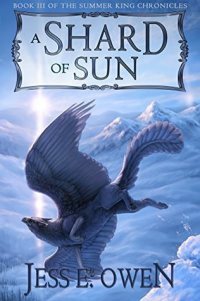 A dragon of the Sunland has left her newborn kit to his care, and now Shard has difficult decisions to make about how best to keep the swiftly growing dragonet safe, while remaining true to his own destiny and the prophecy of the Summer King. He sets out to return the dragonet to his kin in the Sunland and find help for his own quest, but his hope for making wise and benevolent allies is quickly replaced with the reality of cold, mistrustful dragons who want nothing to do with gryfons, Shard, or his wars in warmer lands. In the Silver Isles, the warrior gryfon Caj sets out on a dangerous hunt for his mad wingbrother, Sverin, once the mighty Red King. The safety of the pride, and in the end, Caj’s life, may depend on his success or failure. Meanwhile, Shard’s wingbrother Kjorn seeks to find him and reconcile, and his quest will take him across the land that was once his birthright and into the heart of tricky alliances, enmities, and the ever-looming threat of the Voiceless, fear-mongering wyrms. The Song of the Summer King promises that one will rise higher, one will see farther, and his wing beats will part the storm . . . but as Shard learns more of the world and the tangled threads of fate, he begins to fear that no one can part the storm of growing hatred and fear–not even a Summer King. A Shard of Sun does what the previous two books have promised (and delivered). It brings you deeper into the Silver Isles and even Sunland. You learn more about the deepest secrets of Sverin…about the Dragons and the wyrms. Besieged by darkness, can Shard truly do as he promises, and fly high? Kjorn is seeking Shard in the Sunland, with the Nameless again named. Shard is the only one who can bring together all the species – gryfon, eagle, painted dog. They gather in his name, in his honour. When it comes down to it, will Shard find his path through the stars? There is even an amazing twist for certain characters. The wolves of the Silver Isles feature in this book more than in Sunfire. Catori, my personal favorite, shows herself briefly, but I love the way that Jess Owen has managed to advance the storyline without sacrificing the characters that I personally have come to love. The dragons are revealed to be entirely different to what you expect – there is a unique slant on them that I cannot help but love. If I could, this would receive 10/10, but for now, 5/5 will suffice! Get the rest of these books as soon as you can – I’m waiting eagerly for the next book already! A Shard of Sun is available on Kindle on March 14th, 2015! Yes. I missed posting last week, as needed a week off from this challenge! Not because it’s boring, but because it’s truly challenging me to think in different ways (and I kinda hit a small slump >.<). But, cracking on with the challenge – this week was, again, from the Wonderbook: The Illustrated Guide To Creating Imaginative Fiction. Page 25, this week, as chosen by Jennifer Don. This was a doozy of a challenge. A picture prompt, nothing to really learn – bar writing from a prompt, I guess! This was just entirely different for me…a fun, short, flash fiction more than anything else, however. So – without further ado – the challenge (and prompt)! If suddenly confronted by an image like this from Jugend magazine (c 1900), could you create a story about it? Write one right now. You can see it’s hard, right? Well this is what I came up with – and think….1600s/1700s for the time in this. Or….Victiorian Britain. That works rather well! Two days later, he still stood in the same place, though now joined with another three towering piles of books. Nothing had compared to what he had read. No creature, real or imagined, matched the unrealistic proportions of the one he had in front of him. He wandered closer, picking up one of the quills he’d been using to make notes. ‘This’ll make a good tool to check on it…I’m pretty sure, anyway. It had better not be Sir Thomas and Sir Barry poking fun at me again!’ He would be sure to wager against them next time they were sure to use. Turning to make sure both birds still remained safely tucked away behind bars, he drew in a deep breath before tentatively poking the flesh of the creature. He recoiled back. There was no boom. No bang. No pop, to make his birds keel over of terror. Instead, he observed, through weary eyes…the creature losing air. A squeak, long, loud and shrill rang out. He pulled back, believing it to be some sort of incendiary device, until it moved again. It sagged, an empty sack on the ground, leaving behind an awful smell of rotting fish. He snorted, using a handkerchief tucked in his pocket and scented, to protect his sense of smell. He saw, pinned to the back of one of those wings, now loose from the fish flesh. I truly hope you enjoyed the look at the world’s fast spotted flying fish. Remember, take care of it! No sharp objects. This fish can truly fly, but they are particularly vulnerable to damage. I return in a fortnight. Of course…Sir Benjamin had no option except to curse, loudly and fluidly, in a manner that did not suit his station as a noble sir. Of course – this is why I dislike this challenge. It was rather limiting, in my opinion – however – why not join in? Come and have a go, and join me here next week for another challenge! So, it’s Wednesday…and that means a challenge to be posted! This was through the Wonderbook: The Illustrated Guide to Creating Imaginative Fiction again, this time working around the idea of hooks! How do you hook a reader? Do you go before the ‘main event’, during it or afterwards? How do you create any tension? It was interesting to read the chapter, as hooks are important in books. I’m now not too sure on what I’ve come up with…but it’s 11pm and I’m getting tired! 😀 This was chapter THREE of the Wonderbook, which makes the journey through this book much skipped through! 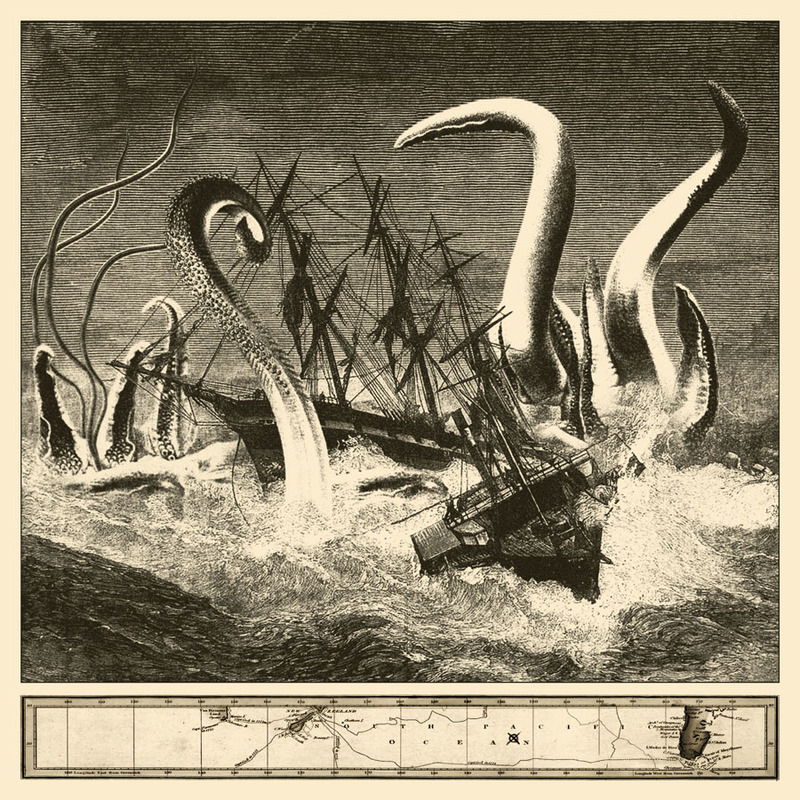 Even if your scene starts with a scene as intense as a giant squid attacking a ship, you still have decisions to make about what to emphasize and not emphasize. You’ll need to know who your main characters are, and the context for the scene pictured – when and where does it occur, and why does the beast attack? Then list possible ways to begin the scene that change the emphasis. For example, do you begin with the beast being sighted, the attack underway, a few minutes before the attack, or…? What do we see first, second and third? Provide an explanation for why each opening might be effective. Then come back to your list after you’ve finished reading this chapter. Has your perspective about what might work changed? If so, how? This was NOT an easy challenge. Not at all. I don’t even know if I did it right….but oh well! I’m doing my best, but some of these challenges are kinda tough! Get ready to be wowed by my extraordinary skills in creative writing…when I’m exhausted! Beginning with the attack will bring the reader straight into the tension, straight into the action and the hook of the story. First thing to be seen with the attack would be the ship sailing on water what is beginning to stir. The second would be the first reaching tentacles. The third, a lone figure calling the alarm. Beginning before the attack would give the reader a little bit of backstory before the attack begins, creating a mood of anticipation. A single man, calling to the waters, calling forth a kraken marked with *one colour*. Second scene would be ships pointed out in the distance. Third would be the kraken and man making an agreement. After the attack would create mystery and get the reader asking questions. Something which is needed sometimes. A ship splintered into pieces. People clinging to the pieces. Tentacles disappearing into the water. As usual, feel free to take part if you can – and even understand this. I don’t…so who knows if you do! Definitely not my favorite challenge. It was tough, and I don’t mind admitting that!